All those who entered Kasey's Awesome Giveaway yesterday do not forget to check the winner's circle tab at the top of the blog to find out if you are the Winner. 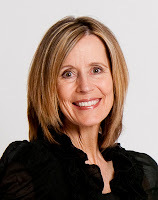 You will have 2 days to comment on the winner announcement post or email mormonmommywriters@gmail.com with your information so we can get your prize to you promptly. If we don't hear back, a new winner will be chosen. Good Luck!! And keep coming back for more chances to win. Today's featured giveaway can be found at the end of today's post. Last Tuesday I promised I would share with you about what has happened during my hiatus from Mormon Mommy Writers. A month or so after my last post in March, I gave birth to our second child, a handsome baby boy. When he was six weeks old my husband and I noticed some unusual bumps on his head, under his chin and arms, and various other places. A doctor within his pediatric office asked me if we had pets and basically told me with the exception of the largest bump on Little Man's head he had bug bites. The large bump she diagnosed to be a subaceous cyst that he may have to have removed later in life. None of those bumps were bites, that much I knew, but having only one bump labeled otherwise I googled subaceous conditions. The results frightened me. My fear kept growing, I needed to know what ailed my baby boy. Following my mom instinct and the promptings of the Spirit, I made an appointment with a pediatric dermatologist for a second opinion. By the time he was two months old, Little Man was diagnosed with Juvenile Xanthogranuloma. (It is a mouthful isn't it?) The dermatologist told me the disease is very rare, but it will correct itself and not to worry. He would however have to have his eyes checked to make sure he did not have any lesions in his eyes. I was so relieved for about 5 minutes. Then, I did a bad thing... I googled AGAIN. I found posts from parents who had lost their children to this disease, and children who lost their eye site. Kids undergoing chemo. I was back to my crying spells. The first weeks after diagnosis were the worst. I scoured the internet for every scrap of information on JXG (and there really isn't much). All I knew was I was not ready to lose this precious boy. Although it appeared that when the disease is left to its own devices it will eventually spontaneously correct itself; it sometimes attacks important organs resulting in treatment is similar to cancer. Our son had many lesions that were multiplying, and after a chest x-ray and abdominal ultrasound, we discovered he had at least one internal lesion on his spleen. Gratefully, his eyes were clear. There is no set amount of time for the disease to run its course, because each case is unique. All of the uncertainty really got to me, it still does at times. But Little Man is so strong. He meets all the milestones early. If he didn't have the yellowish cysts you would never know he had any health concerns. Because he hasn't had any complications so far doesn't mean that they will not arise. I have talked to my mom a lot more than usual since his diagnosis. Asking her how anyone can survive the loss of a child. At the beginning, I grieved a loss that had not even occurred. I told her all the reasons fueling the fear that I would lose him. My mother's response to me? "Have faith that the Lord will do what is best." That did not comfort me. I wanted certainty... I still want certainty. I did and I do have faith that our loving Heavenly Father will care for his children. I am also aware that this does not mean that bad things will not happen, or that we will enjoy the methods our Lord uses to shape us. I repeatedly told my mother that I did have faith. Because even if our little man were to die at a young age, I would still believe in God, I would still love God, and I would still strive to serve God. I would just mourn our temporary separation. I told my mother I needed peace of mind and acceptance. Whether it has come through prayer or other means, I do have peace. And I have a thriving 8 month old and a witty 5 year old who keep me away from my WIP more than I would wish. But in all honesty, I wouldn't change too much. Every day I have with my little ones is a blessing, and that I will never wish away. Is having faith the same as having peace? 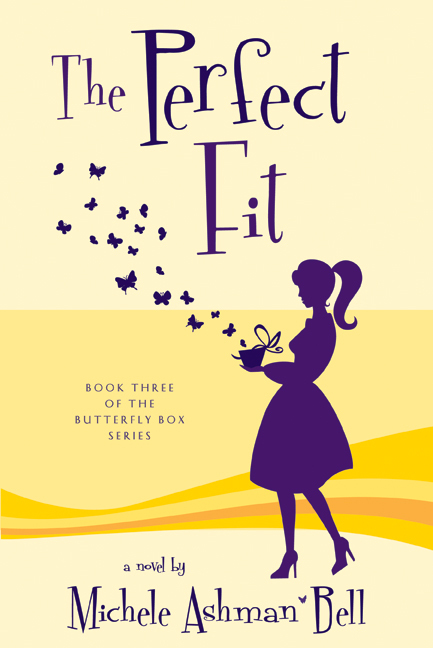 Michele Ashman Bell has graciously offered to send one lucky reader a copy of "The Perfect Fit" book three in her butterfly box series. Description: The Butterfly Girls can’t wait to begin their fourteenth annual weekend reunion, a time to renew their bonds of friendship and honor the memory of their high school friend Ava. But a dark cloud of fear soon forms in their shared hotel room when they learn that one of their former classmates has been brutally murdered. And when new evidence suggests Ava was murdered as well, the friends realize one of them might be next. Andi is glad to be taking the Butterfly Box with her to Hawaii, where she plans to spend a few weeks participating in a reality dating show. To her surprise, the eligible bachelor, Michael Makura, soon singles her out for attention, provoking jealous acts of sabotage from the other contestants. Soon a series of unusual events disrupts the pair’s fledgling romance, and Andi starts over in New York where she begins dating a great guy and accepts a job offer from a generous, eccentric man. But when Michael unexpectedly shows up, all is not well in the Big Apple. And soon Andi comes face -to- face with the man who killed her friend—and he aims to kill her as well. 5. You can earn an entry by viewing the embedded book trailer and letting us know by commenting below. hugs and prayers! Everything will turn out the way it's supposed to, even if it doesn't feel that way now. The most important thing is your support system, and it sounds like you've got a good one with your mom and husband. Amber, Your story is inspiring and helps us all to remember what's really important in life. When my children were young, I used to get so frustrated with the fact that I couldn't seem to write. I am grateful now that I spent so much quality time with them and didn't have to share it with my characters. But also because instead of writing I learned about the writing and publishing world. So by the time I was able to able write whole books, I already knew what I had to do to make it happen. Also, thank you so much to Michelle Ashman Bell for making an appearance on our blog and donating one of her awesome books. I really enjoyed the interview! Oh, and I'm now following. Amber, thank you so much for sharing your story. I could feel the pain and frustration. It is so hard to rejoice in the moment, knowing that devastation may be waiting around the bend. I admire your courage. God bless you! Oh man, Amber. How stressful! My oldest son had a Nevus Sebaceous and it took two surgeries to completely remove. That kind of stuff is so hard. He's a darling and I'm glad things are going well. Good Luck to you. Life is sometimes more difficult than any of us expect or want. I am a follower and would certainly love to win the prize. I admire you for sharing your story and the great faith you have. What a wonderful example you are! Thank you for including me in your blog. It's such a blessing to connect with great women and feel strengthened and uplifted! Praying for you and your son! When my son was 15 months old he developed a staph infection in his lymphnode on his neck and had 2 surgeries to drain it, then a few days later we were back with the some problem on the left. This prompted extra tests from doctors, long story short, they scared us thinking he had something else and we might lose him, so I understand your worry. He recovered fine and is growing. I'm glad you still have faith, and I'm sure everything will work out according to His plan. Hoping for all the best for you and your darling baby. There are questions about our little granddaughter's potential, and we don't have many answers yet. Achieving some sort of peace is the only way we'll get through it. after having three miscarriages, i had to find the faith that i was really suppose to follow a prompting to have another child, and to find peace with the loses i had. i found that when i finally found that sure faith that God had a plan, that i found peace. i couldn't just have faith in Him, i had to have faith in His plan. we did eventually concieve, and i now hold my newborn son. now i find myself trying to trust the Lord's plan for my son and not worry about all the little things that go wrong. hope you will find that inner peace and be able to hold onto it. I'm sorry!!! And I shared on Facebook. So great. I subscribed to on FB too! Love the blog. it's great. LOVE Michele Ashman Bell too! I'd love to get this book. She's one of my favorite authors. Thank you for all the concern. I truly have found peace with Little Man's JXG. He is such a happy baby. These days I just smile and enjoy the blessings we have. Bon Chance to all those that have entered. Amber, my heart goes out to you! What a thing. Your faith sounds a lot like ... faith! I just found a plaque and bought it: "Faith isn't knowing what the future holds, but Who holds the future." How terrible!!! I have never heard of such a thing and it's such a strange thing. Much prayer and happy thoughts go out to you in hopes for a quick healing. Okay....now I'm a follower of Michele Ashman Bell!!!! 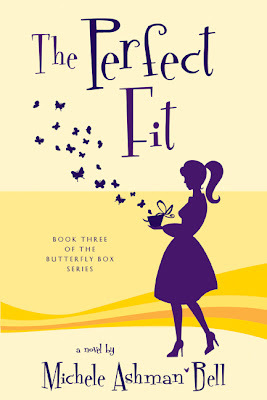 I've already read the last Butterfly Box book and loved it!!! Now I have advertised your wonderful blog giveaway on my facebook page!!!! Thanks for all the opportunities!! !